Crafting a satisfying finale for any series of modern Doctor Who is an incredibly daunting task, having to reference and wrap up lingering storylines and character arcs while also providing the requisite emotion and logic to satisfy loyal viewers while catering to the largest audience possible. 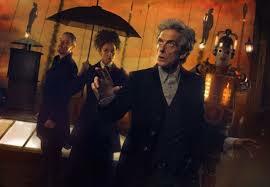 With Peter Capaldi’s departure publically being touted as only one episode away during this year’s Christmas special, ‘The Doctor Falls’ carries even more weight than most, and Bill’s conversion into a Mondasian Cyberman in the presence of two iterations of the Master certainly sets the stage for a bombastic adventure, one that as a whole is one of the most satisfying finales to date. While some may lament that John Simm’s Master and Michelle Gomez’s Missy were not even more prevalent, each of their scenes together is pitch perfect and helps to lend a sense of earnestness to Gomez’s wonderfully unpredictable version as she flits between reverting to her old self and standing beside the Doctor in his continuing battle against evil. Simm’s version is so overtly evil that he is willing to destroy himself to prevent anything he does during any of his lives that could be deemed as being aligned with the Doctor from occurring, and the tortured Missy quite literally battling against her past demons is wonderfully satisfying from beginning to end and adds a needed anchor for this personal journey she has been on throughout this run of episodes. The fiery hatred of Simm meshes perfectly with the subtle nuance of Gomez and speaks to the complexity of the Master as a character excellently, and the tease of the two traveling together is so enticing that it’s almost a shame that the almost inevitable but far more fitting and emotionally satisfying deaths of both of these characters at each other’s hands must occur. The controversial aspect of ‘The Doctor Falls’ will inevitably be Bill’s fate. Even just within the context of the modern series, Doctor Who has a rather pointed history of saving doomed characters and companions when all hope seems lost, and that once more occurs with Bill who quite fantastically spends almost the entire episode coming to terms with what she has become and the emotions that instills in those around her. Indeed, the shifts between the mechanical intonations of the emotionless Cyberman voice and the harrowing looks at Bill as she perceives herself provide some of the strongest moments of the story, and it’s a nice touch that it was her months living under the secret rule of the Monks earlier in the series that has given her the mental strength to retain a sense of individuality despite conversion. However, though the story does incredibly well in highlighting the Doctor’s failure as Bill struggles to adapt to her new life, the undoing of her fate feels underwhelming and somewhat out of the blue. Granted, all of the framework for Heather’s return and abilities was very clearly laid out back in ‘The Pilot,’ including the discussion of the all-important tears and Heather’s penchant for following Bill across the universe; however, as uplifting as it is to see Bill get to travel amongst the stars with the woman she loves, there simply was not enough done in the premiere to give this relationship the needed weight to deliver the intended emotional impact as Heather frees Bill from her confines. Of course, Matt Lucas as Nardole cannot be forgotten in what looks to be his final story as well, even if he is very clearly meant to be a secondary character here. He proves to be the Doctor’s intellectual equal and is a vital component in the resistance against the Cybermen, and though it would have been nice to see his shadowy past detailed a bit more, the Doctor’s admittance that Nardole is the stronger of the two and is the better choice to accept a life-long fate as the protector of the civilization’s future rather than being the one to sacrifice himself is a poignant ending. However, it is unabashedly Peter Capaldi who manages to shine brightest despite the incredible performances from everyone involved. The sheer magnanimity on display is immense and shows just how far this incarnation of the character has come since his first episode, and the sacrifices he makes just because fighting evil against all odds is simply the right and decent thing to do speak volumes about the true personality of this sometimes brusque version. Moments like these- again highlighted by a masterful speech- are certainly nothing new, but to knowingly walk into a losing situation with no hope of victory is the ultimate actionand test of character, and Capaldi sells each and every minute of the Doctor’s kindness, anguish, anger, and sense of righteousness as the script demands. And although the regeneration process has started, the Doctor has refused to accept it, pushing it down on multiple occasions already. Never before has a Doctor tried so hard to fight against this natural process, regeneration simply being a plot device with variable degrees of emotion attached to it to transition leads, and this certainly opens up many opportunities to explore just what this process of change means on a very personal and dramatic level. ‘The Doctor Falls’ in unquestionably a great piece of drama that works on nearly every level, making the most of its expanded roster of stars and its expanded running time to deliver a truly profound ending to this series. With one episode in the Twelfth Doctor’s tenure left as he fights his regeneration and crosses paths with his very first incarnation, the scene has been set for a truly momentous end of Peter Capaldi’s iteration.